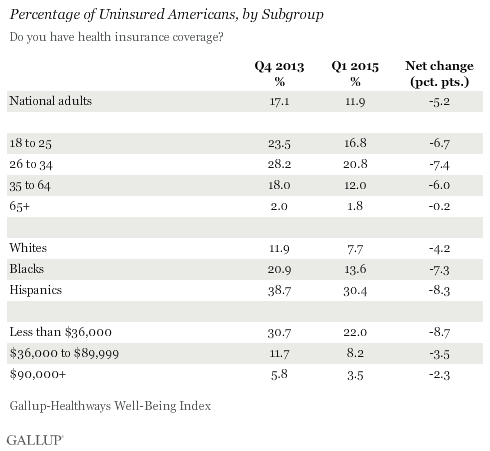 The Gallup organization has become the go-to sources for monthly tracking of progress in reducing the numbers of uninsured Americans. Yesterday, they came out with their latest estimate that the percentage of American adults without health insurance has now dropped to 11.9%, down from 18%in mid-2013, and down from 12.9% in late 2014. Because rates of coverage are higher among children, the overall uninsurance rate among all Americans is lower, though no precise estimate is include. 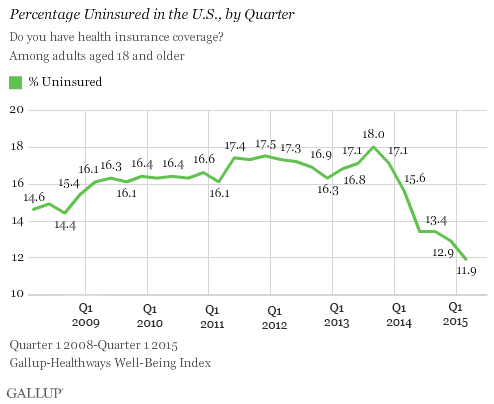 If you look at the chart, it’s unmistakeable that the drop in coverage began with the implementation of the major Affordable Care Act insurance coverage expansions that took full effect on January 1 2014. Of course, if all 50 states — instead of the current 28 — joined the Medicaid expansion for poor adults, then the rate would be substantially lower, especially with the addition of states with very high rates of uninsured adults such as Texas, Florida, North Carolina, Georgia, Louisiana, and others. We can hope that 11.9% will not be the new normal for long and that the next new normal will be even lower. This achievement is a victory for Americans everywhere working so hard to make sure that everyone benefits from the ACA. Below are some more details — you can see that the expansions are working precisely as intended, and that the groups benefiting the most are those with the highest rates of uninsured: the young, those with lower incomes, and racial/ethnic minorities.